Shooting turkeys during midday isn’t impossible, but there is no doubt the vast majority of gobblers are shot within the first hour of hunting. The best way to take advantage of the first light bird bonanza is to scout well. 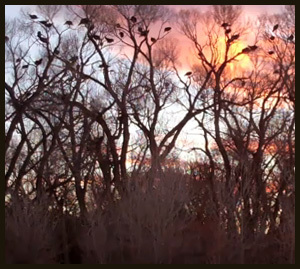 Most of the time that means roosting birds. A lot of hunters call roosting turkeys “putting them to bed.” Essentially, it is getting out in the woods and finding out where turkeys are spending the night so that you can be set up in the perfect spot in the morning. But there is more to it than just wandering around in the woods. If you have a good idea of where birds are roosting, you can glass that area from a distance. Look for where the birds are flying up because that’s a good indication of where they are going to fly down in the morning. From there, find a spot you can set up to ambush toms when they do fly down. Another big thing to look for is a way to get to your ambush spot without being detected. Now, if you’re not sure where turkeys will be roosting, you’ll have to find them. Usual locations are creek bottoms with hardwoods or hardwood ridges alongside fields. Look for these types of areas while trying to get gobblers to talk to you. This is best done by using a locator call. An owl hooter, crow call, or even coyote howler will usually get a gobbler to do his thing. Once you get a response, it’s time to shift into recon mode. Try to get as close as you can without getting busted. It’s best to keep him gobbling so you can keep tabs on his position. Of course, you want to be in full camo. You are essentially hunting this turkey without a gun. Once I get within a hundred yards or so, I’ll move in really slow and try to find him in the tree. The skyline is still somewhat blue while the ground is dark. If you move methodically, you can see him without being detected. Once you’ve got his location pegged, try to figure out where he’s going to fly down in the morning. If there is only one possible landing area, your job is pretty easy. If there are multiple landing areas below his roosting tree, turkeys will usually land into the wind with all other things being equal. After you’ve decided on a landing area, find a spot to set up and of course a route to get to your set up without getting busted in the morning. Another question to ask yourself is, “is there a way to set decoys without being exposed?” If the answer is no, there really isn’t any reason to carry decoys out with you in the morning. I like hunting with decoys but if they can’t be used, it’s not worth carrying them out. The idea is to be stealthy. If you’ve got a GPS, mark the spot. I’ve roosted birds and picked out a spot to hunt only to realize as the sun comes up that I was 50 yards away from my intended set up. Sometimes it doesn’t matter and the gobbler comes anyway. Sometimes this blunder ends in frustration. Save yourself the trouble and set the point. As the saying goes, “roosted ain’t roasted,” but it certainly gives hunters a huge advantage. Roosting birds is also a lot of fun. Take a look at the following video. These guys scouted this bird the night before and this old gobbler came right in. Great hunt!